I read somewhere this week to stop saying, “I have cancer” and start saying that “God has Answers.” What a great perspective to have while moving forward. It’s time to turn the page and begin the next phase of this process and begin to think about treatments with my bilateral mastectomy behind me and new pathology reports in. There are a few things I am going to hold on to moving forward and the most important is that God has positioned us for a miracle. Here’s the obvious; I found a non cancerous lump and went for an over due mammogram. Right behind that lump is where the cancer was hanging out. Stage II, late but still early. God warned me in His Word before the mammogram that I must take quick action when I hear the trumpet, so I did! I am at the most aggressive cancer treatment center in Las Vegas. My surgeon had never taken an uninsured patient before and found grace to take me, I was fortunate to get in. Miraculously, I will be insured at the onset of treatment. God has provided in every area of our lives. So far, all medical bills will get paid. One of our daughters can stay in college because of the generosity of friends and family. I have seen healing within my family and friendships. Everything is going to be okay. I’m in a bible study called “Believing God” by Beth Moore. She has pointed out in her study that Jacob was not given the keys to the city so to speak when he came into the Promise Land. He had to conquer it! He had to win it back! Jacob had to believe God, not be afraid and carry out all that God requested. Gosh, that just has not left my mind nor my spirit. A dear friend of mine makes beaded bracelets which she so sweetly gave me on the day of that mammogram. The bracelet is hand beaded with each bead representing the story of creation and Jesus’ resurrection. I memorized the symbolic meaning of each bead so I could tell other people and walk them through the story as they inquired. Well, I memorized all the beads accept one. I couldn’t remember the bead that represented the Miracles that Jesus performed. Boy, how I studied that bead, looking at it from all angles trying hard to remember what it meant. Then when my friend told me what it was, I knew that I was going to become familiar with Jesus’ miracles. So, as I move forward to take back the Promise Land that God promised Abraham and a thousand generations ( that includes me and you) I will commit myself to Believing God for a miracle. Yesterday I set out to look for wigs and prosthetics. So, I opened my handy-dandy notebook and began to call some resources that were published in some of the reading material found in my “little pink book bag”. 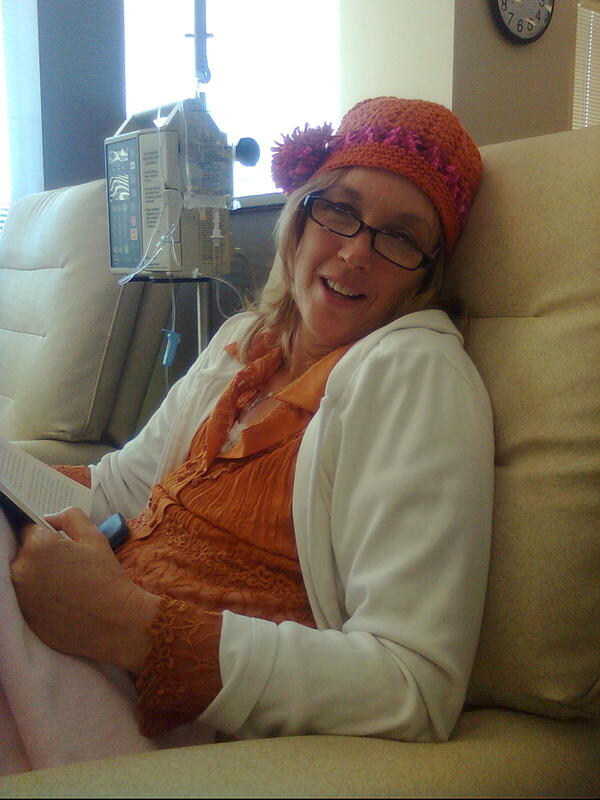 Monday morning I’ll meet with my Oncologist for the first time and begin treatment options. Please pray! First up was American Cancer Society 1-800-227-2345 www.cancer.orgThere was a cancer specialist on the other end of the line who went over my diagnosis with me. Told me about the typical treatment I could expect and in general gave me more information and perspective about the type of cancer I have. In addition to that helpful information they gave me some other practical resources. Support group called Reach to Recover. This is one on one support. I will be matched with cancer survivor who has the same diagnosis as I do. Yeah! I can learn from someone else’s battle how to beat it. Look Good Feel Better is a 2 hour workshop when beauty experts from the community come together to show patients under going treatment how to maximize and enhance beauty techniques. American Cancer Society Resource Center for Wigs, prosthetics, Hat and Turbans! Health Insurance Information Team– There are three types of insurance available for pre-existing. 2. Local, State and Federal assistance ( Social Services, Medicaid and Social Security) . 3. Women’s Health Connection. You must be diagnosed through affiliation of the Women’s Health connection and Insurance will be available through the Breast and Cervical Cancer Prevention and Treatment Act. Monday was my first oncology appointment and the weather held perfect expression for me. Rain wasn’t pouring from the clouds that hung low, it was only a slight drizzle that lasted all day long. There was a chill indoors that was somewhat uncomfortable. I wrapped myself in a big sweater, stood at a window that faced the backyard and then the weather and I cried small raindrops all day long. I realized that as the rain was coming down it would bring rich nutrient to the soil and that’s beneficial… so, it was a good day to cry. The bright spot of the day was taking a step into the new world of oncology. Who knew that I would love a doctor so much who was going to prescribe poison for my body? Who knew, she would be kind and compassionate, gentle and patient? I’ve driven by this place a million times and never noticed the packed parking lot! There was a little city going on inside of this medical office park. I’ve never seen so many people in one doctors office before. The chemo chairs were full, the waiting room was full and every patient was being soothed. I’m the new girl in town and I think I’ll fit right in. I’m not alone. I had only ever known a few people with cancer and now there is a whole damn building filled with people like me, strolling down the recovery path! You know you’ve got something threatening when you have a team of doctors! This doctor was selling me an insurance plan called chemicals, that would increase my odds of cancer being killed off systematically. First, twelve to eighteen weeks of chemo followed by six weeks of radiation and then five years of hormone therapy. My hair will fall out, I’ll get sunburned and complete my menopause cycle. “It’s optional,” she said! “Not for me, hook me up, let’s get this thing started.” I didn’t hesitate one single moment. With each layer of treatment my odds of survival increase. Treatment can’t start until I am finished healing from the mastectomy. She must have meant physically healing because I’m pretty sure it will be quite sometime before I’m mentally healed from this amputation. I just want a day between now and that first drip of chemicals where I don’t have to think about my life, my fight or my prognosis. I wanna go to the San Diego Zoo. I wanna laugh at the monkeys and be awed by the tigers. I wanna eat pop corn and watch the towering giraffes. I wanna be surrounded by life and at a simplistic level. With GREAT FAITH, In the name of Jesus!!! I like sunrises more that sunsets. Jan 28th, 2012- 11:50pm, 12:10am, 12:28am, 1:30am, 1:45am, 2:10am, Bible study read Isaiah 41:10 and pray it back “Please strengthen me and Help me“ , Tylenol PM, 2:30am, 2:50am, 3:10am, 3:28am, 4:15am, 4:35am, 5:20am, 5:30am, 5:28am, 5:34am, 6:10am, 6:20.… bathroom, 6:30am Bible study again. Thank you God for another day of sunlight! As I heal I’m beginning to realize that the numbness across my chest may be permanent. I can’t sleep a wink as my mind considers all things. Mostly, bad things. I’m taking clippings and excerpts from one line sentences throughout the week to battle my bad thoughts. Officially I‘ll call it living hell. I tried to convince myself over the long night that everything would be okay with verbal evidence I picked up during the week. I’ve heard, “This is beatable”, “ you may still get feeling back” “reconstruction can come later” , “You’re beautiful”, “You’re courageous.” God’s Word says, “He will strengthen me”, “He will Uphold me”, He loves me”, “He will help me.” I wrestled all night long with my bad thoughts which I don’t even have the nerve to put in writing right now because they were so morbid. Perpetual optimism used to be my husband’s most annoying attribute in my eyes. I laid there awake doing mental gymnastics hoping that he would wake up and share his Good Ship Lollypop opinions with me. I was hoping he’d find me stirring and remind me that the birds were chirping in another part of the world or remind me of all the cases where someone else was worse off than us. Better yet, that he would point me back to Jesus. Instead, I tried to lay still so I didn’t wake him up, with my eyes facing the clock and waiting to fall asleep. This is “The Fight” or at least part of it. It was a rough week meeting the oncologist deciding on the treatment plan and returning to the surgeon to get all the drains and tubes removed. I am trying to hurry and heal from the surgery so I can start treatments. Honestly, I don’t want to start treatments. I don’t want to lose my hair and I don’t want to be numb across my chest anymore . The fight is getting through all of this mentally, emotionally, physically and spiritually. It’s time to deal with stuff! You know the stuff I’m talking about. The stuff crammed in that outdoor shed that you’ve been meaning clean out for years. It’s dealing with the control freak within and the abuse taken as a kid. It’s handling insecurities and stubbornness. It’s an opportunity to let God in those self protected heart places. Breath, just breathe Sheri. It’s time for the next step. Chemo starts today. Come,pray with me for a total and complete healing. Hello gang, so sorry I haven’t written in a long while. I’ve been trying to digest all that has happened. It’s been like drinking a cup of water from a fire hydrant. I grew up here in the desert and was told somewhere along the way that the reason we have flash floods is because the land is so dry and hard that when the rain finally falls it can not be absorbed because the land is not porous. When the rain falls it quickly runs over the hard surface of the desert landscape causing a flash flood. The Diagnosis back in December hit a hard surface. The constant pounding and sometimes dripping of reality have softened the hard ground and it’s beginning to sink in one slow day at a time. I stare at my healing chest and recognize that this is a process. Step 1, surgery behind me. I remember that when I considered my options for surgery I couldn’t cope with more than that. I remember thinking that I couldn’t consider Chemo treatment or even research it because I was already overwhelmed with the decision of mastectomy. It’s been several weeks of healing and preparation for Step 2, treatment. Along the way there have been a few bumps in the road. I’ve had to have the tumor slides retested because there was a conflict in results. That delayed the treatment by a week. More than the aggravation of delay was an incredible uncertainty and acceptance of a different treatment plan…. A longer treatment plan. We walked all the way around that block to have the test results remain the same and the decision to continue down the original path of treatment after all. Now, I have had time to read about the treatment plan and side effects which have hit hard ground once again. There is so little time for acceptance before treatment starts. I must have read in every cancer book that part of this journey is to make sure you seek a second opinion. Doctors are brilliant, talented and above average decision makers. They are also human! I love my doctors and trust them very much and believe that they have my best interest at heart. With that said, I am seeking a second opinion from the Mayo Clinic on Friday March 2nd. Oh how I wish this was a simple clear-cut black and white battle, but it’s not. “It’s rather several shades of gray, ” one doctor quoted. There have been many issues about the facts of this diagnosis that are borderline and bothersome! Where one doctor says treating a slight HER2 positive issue is not worth all the consequences of possible side effects another doctor says that even a slight positive score must be treated! All of that is complicated by two different tests; one reports a negative presence and the other a positive presence. So, off to Mayo Clinic we go looking for the tie breaking vote. The Mayo Clinic sent us a checklist of all the tests they want to review. I am completely impressed that they want to see the diagnostic tests for themselves, they also want the original tissue slides and written reports. It seems to me that they are going to take a fresh analysis approach to the case and file. I am so relieved! I consulted another breast cancer group who only wanted the written reports. I believe we’ll be in great hands when we arrive in Scottsdale AZ. Meanwhile the Chemo treatment I was supposed to get last week, will be done this coming week. Then when Mayo determines we are on the right track, fantastic! If not we’ll change it up, but we must get started. The local doctors office where I go continues to impress me with their financial aid. Before the insurance kicked in they guided me to call ahead and negotiate cash prices with the service providers. What would have been over $55,000 paid out in cash was reduced to about $15,000. With the generosity of friends and family, a large chunk of that has been paid. Just the other day they sent me paperwork to fill out for the Patient Advocate Foundation Co-Pay Relief Program, who will help us with the co-pay payments. They really have been remarkable with helping facilitate the assistance needed to get the proper care. Mornings like this when I wake up and feel nervous and scared, all I have to do is think about everything I can be thankful for and it settles me. I am so thankful that I’m not alone, that I have been well taken care of, that I still open cards and letters every single day, phone calls from friends, that my husband holds my hand even while I’m sleeping, that two of my daughters and my mother have journeyed many miles to spend some beautiful sunny days with me and another daughter and another sister are on their way. I am thankful for cancer research, for the Mayo Clinic, for the pink ribbon tattoo my niece put on her chest, for my new dammit doll, for a song my sisters dedicated to promise to love me through this, for the joy all my grand children have given me, Good morning. Finally, brethren, whatever things are true, whatever things are noble, whatever things are just, whatever things are pure, whatever things are lovely, whatever things are of good report, if there is any virtue and if there is anything praiseworthy–meditate on these things. Gosh, I have been dreading this for days and weeks! Everyone made it so endurable that I walk away feeling like I experienced a shower of love. The kinds of showers that grows your heart to a greater capacity to receive. We’ve all met people who had a Big Heart. I want to have one of those.. A Big Heart! Thank you God for growing my heart. Prepare yourself to see the word therapy written down and know that I mean chemo. I just can’t call it chemo. It is tied to so many bad implications. Realistically today’s therapy really doesn’t compare to the way it was used like a loose cannon in the days of past. Doctors are so specific in the way they prescribe it. That’s why I had to wait for more tests to be done before we got started. No doctor is going to prescribe a medication for you that has more consequences than the disease they are fighting. Not to mention all the in-between blood tests to monitor ever organ and blood count. So from here on out I am going to call it Therapy! We left for Therapy about 10am on Wednesday morning which was only about 45 minutes after I spoke with the nurse who said they had an opening! This is NOT a typical way to start your first day of therapy! For me though, it was a better way. Last week I had read a three-ring binder filled with possible side effects and it had me so freaked out that I just wasn’t ready and ultimately glad that therapy was postponed last week. I had a dream a few days before we started that I was in agreement with the rest of my body parts that we were ready to get therapy. As if they could talk to me? That dream came on the heals of a MUGA-Scan test that I took on Monday. The MUGA -Scan measured all the functions of my heart valves so we could have a baseline knowledge of its health. If I end up needing more aggressive treatment recommended by the Mayo Clinic they will want this test. The most significant part of having this test was the positive self talk I found during it. As I lay there strapped to the table and arms pinned down to a tiny one foot wide table and a massive diagnostic machine over me within inches of my very scarred and flat chest, the fight internalized. All of a sudden I heard the 15-year-old Clark High School cheerleader in me begin to chant. V I C T O R Y. Victory, Victory, that’s our cry! Go Fight Win! Defense Jesus Defense! Then I could hear the almost audible sound in my ears of men marching. Thousands of marching boots. I could visualize Gladiators holding spears in the shape of a cross and marching, looking for the enemy. It was then that I remembered that there is a protein structure outside our cells called Laminin. It forms the shape of a cross. With all this strength of mind, I knew there was authority and power in what Jesus has asked of me. To Believe!